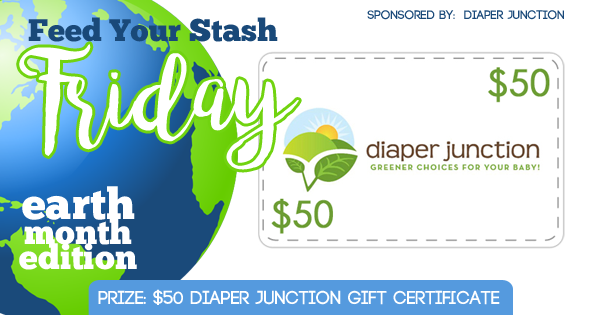 Enter to win a $50 Gift Certificate from Diaper Junction! This week's FYSF giveaway will stay open for two weeks! One lucky winner will receive a $50 GC to spend at Diaper Junction on whatever they like! Use the embedded Rafflecopter form below to enter to win. Winner must be 18 years or older. Winner will be notified by email and will have 7 days to reply and claim their prize. I would love some covers and a wet bag for our new baby due in Sept!! I'd love to get some cute baby leggings! I have so many diapers on my wish list! I'd get some medium prefolds and maybe some Marley's Monsters! I would keep working on my stash for our baby due in August!!!! We are about halfway there with inserts. I would buy flats and prefolds for baby #2 that's coming in July! <3 We currently do not have any for her :( This would help soooo much!!! I’d buy some quality flats and maybe some wool! I’d spend it on some sustainablebabyish overnight fitteds! Is love to try cloth wipes! We need some more Buttons Supers now that I’ve got our nighttime diaper down again! I'm hoping to add some BG elementals and a Thirsties pocket in fern! I would buy some wetbags and some toys to keep my little engaged! Such a generous giveaway. I'd love to try a few of the diaper rite newborn diapers, I've heard such good things. I’ve been considering reusable straws. I could probably use some cloth wipes in my stash, too. I would spend it my newborn stash and a new diaper for my daughter! I would love to win this gift card to buy the next inserts for baby girl! Bamboo is on my list!! Can't wait to find out who won!! I'd spend it on Thirsties! I would try some new brands of cloth diapers if I win the gift card! I'd love to buy GroVia and Applecheeks! I want to try Grovia on my twins!!! I need another buttons diaper in a girly print!! I would buy Diaper Rite newborn AIOs! I would buy diapers for baby coming next Fall! It would have to be re-play products. My daughter lives having her utensils in her favorite color. I'd buy more Thirsties pockets! I would buy the newborn diaper rite 3.1 to try on my baby who is due May 3rd. I would buy diapers, inserts or swim diapers. I would buy a Geffen Baby flat or Fladdle for the flats Challenge & a Thirsties pocket for starters! I would probably get a new super cover, some inserts to prepare for vacation this summer! I would get applecheeks bamboo inserts (when they come back in stock) or, if I couldn't wait that long, I'd get more Thirsties pockets! I'd definitely get some cute leggings and a new diaper or two! ?? I’d buy some Marley’s Monsters, AIOs and inserts. I’d love to buy more buttons diapers!! ???? Awesome FYSF! I would totally try the funky fluff covers, and get some different types of boosters ive had my eye on for a while! I would love to win this and add to our stash! Could use some more pocket diapers, AIOs, covers, or other items. I would buy all the goodies in my cart! I have a DR AIO and an ice cream teether in there at the moment. This mama needs to up her stash with another one on the way. Two in diapers this summer! I would get a hanging wetbag and some cloth pads. I will have my first baby and never used cloth diapers before, I bought a good bit of different brands and systems. Would be great if I get some extra money for my stash! Try out that HIE changing pod! I would buy snappis and boingos and maybe some imagine fitteds and a wet bag.. still building up my stash... and POSSIBLY splurge on thirsties earth day cover w the leaves even tho I don’t actually need that right now! I would buy Diaper Rite 3.1 AIO newborn and one size for my squish due ON Earth Day!! Prefolds and wipes, maybe a changing pad. ???? I'd buy diapers and inserts! I would get some AIO diapers! I would buy a Thirsties cover & some mama items. I would buy some Imagine Stretchy Bamboo Flats! I would get some newborn AIO's because I'm expecting in November! I'm due with number 2 in August and will have 2 under 2 so I'm sure we could put this gift certificate to good use! I would buy some Thirsties naios or Tot Bots aio. I would get some flats and covers....I think lol! Such a hard decision! I would love to get some bamboo or hemp flats!!!! I would DEFINITELY put it towards trying some of the Marley Monsters Unpaper Towels! I would invest in some Super sized covers for my 3.5 yr old. She’s no where close to potty training because she’s handicapped, so that’s our next milestone in our cloth journey with two littles. I can't even think about stuff I'd buy but def I'll get sloomb for my newborn in gods will ?? Our first little one is due in June, so $50 would go a long way in helping us start our cloth diapering journey. Looking specifically AI2s. Buttons, Best Bottoms, and Flips! I would love to get some more training pants for my grandkids. I could go CRAZY with this gift card! We're trying to go plastic free in our home and this is a great way to help us with that! I would spend the $50 on newborn Diaper Rite covers and/or some flats. Could use some trainers for my little guy very interested in potty training! I'd love some Marley's Monsters products to green my home, and am also eyeing a new Tots Bots diaper! I'd buy some newborn diapers! I'd love some Thirsties fitteds. I'd probably get more replay! I would buy more newborn thirsties! I would but some more diapers!!! I would probably buy 2 SmartBottoms AIOs. I've been wanting to try them. Probably more diapers but wetbags and inserts are also on my list. I have no idea what I would buy - new products I haven't tried yet! This is an awesome giveaway. Good luck to all! I would get a small wet bag for wipes and maybe a couple things for myself like a new natural deodorant! I'm due with baby #3 in October. Going to be my first time cloth diapering. I'm so excited! Heard about this website and had to check things out:) Would love to win and buy a newborn stash of diapers?? If I won I would buy training pants because my little one will be ready soon to potty train. If I won, I'd probably get some RePlay and some potty training items. I have my eye on some “Lil Learnerz”. I just bought GroVias but we don't have our full stash. I'm working on OS diapers and then hopefully getting some newborns. I'd probably buy prefolds and flats! Being a mom is intimidating, and becoming a new mom is even scarier, but the help of sites and online communities like this one help. :) thanks. I am stashing up already, a few every month, im in 2nd trimester and have a few brands and mostly pocket one size's. we have a lot more. I reward myself with cloth diapers. haha! my family thinks i am crazy, but I think I want my child to still have a planet by the time they are ready to have their own family. I need a new hanging wet bag. I would buy more wetbags thanks!